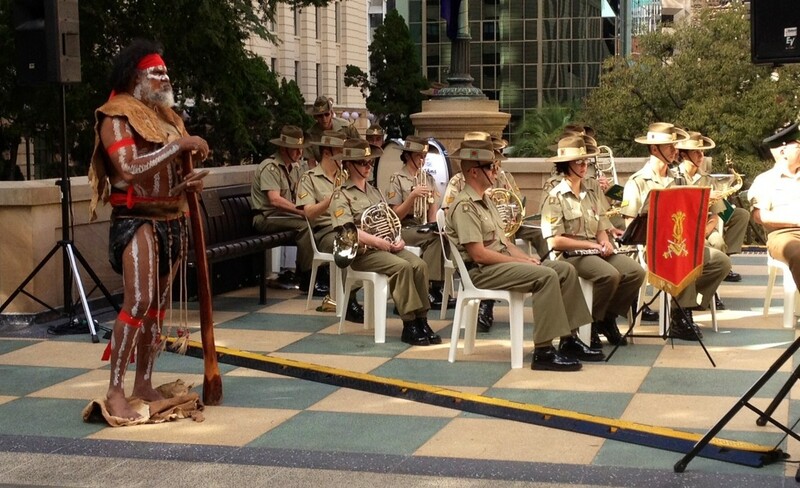 Adrian Burragubba on the didgeridoo with the Australian Army Band at the Anzac Square ceremony. Indigenous men who served in the First World War alongside white comrades created the stepping-stones to reconciliation, an Aboriginal war veteran said today. Speaking at the Indigenous Veterans Ceremony at the Shine of Remembrance in Brisbane, George Bostock said World War I was a special chapter in history for indigenous and non-indigenous relations and should be properly recognised. “This was their time and their opportunity to be free of therestrictions they had encountered in their everyday life,” the Vietnam veteran said. But Mr Bostock said when the servicemen returned to Australia they weren’t allowed to join RSL clubs or offered soldiers’ settlement grants. The treatment of indigenous war veterans was still fresh in the minds of the Aboriginal people when World War II broke out. “Yet again at the beginning of World War II, the sons of the black ANZACS made their way to the recruiting depots to enlist where theytoo faced the same obstacles as their fathers,” Mr Bostock said. Indigenous men served in Korea, Malaya, Borneo and Vietnam before the 1967 referendum which saw Aboriginal and Torres Strait Islanders formally recognised as Australian citizens. Adrian Burragubba played the didgeridoo and the Australian Army Band Brisbane played the National Anthem as part of the ceremony, attended by about 150 people. The ceremony was held as part of National Reconciliation Week, which runs from May 27 to June 3.